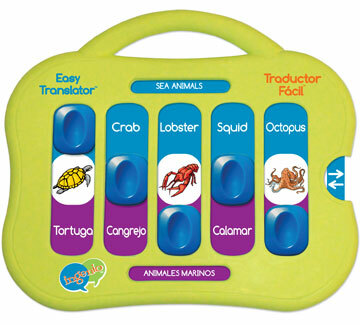 Easy Translator is an exciting interactive learning toy that teaches children English/Spanish basic vocabulary, picture-word association and fine motor skills. 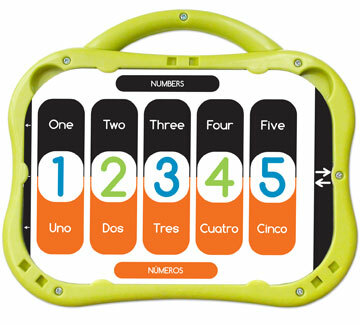 Primarily designed to teach English to Spanish speaking children and Spanish to English speaking children. Slide & Learn 150 basic vocabulary words in English & Spanish. Each card has an unique learning theme, colorful illustrations, and 10 word pairs in English/Spanish. 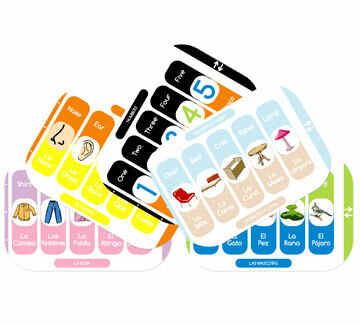 Themes include animals, food, family, body parts, clothes, household objects, classroom objects, sports, numbers, shapes & colors. Compact & Portable - Cards store in the back and built in handle allows for easy portability. 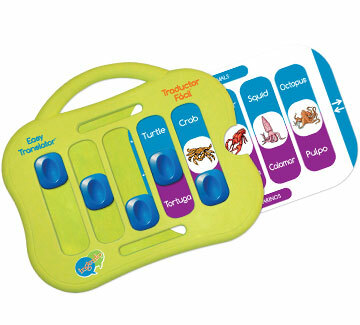 Includes a main plastic unit with 5 sliding buttons, 15 double sided cards and a parent/teacher guide.